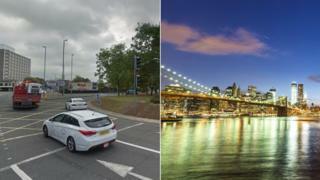 Changes to the road layout into Portsmouth will help create an "almost New York-type" skyline, the city council has claimed. Under council plans, traffic from the M275 would be diverted through new junctions straight to the city centre. The £60m project would allow redevelopment of city centre sites to take place. Council leader Donna Jones said the road layout change would be the first step in a "massive regeneration". "When we've had events like the America's Cup and the Great South Run, our traffic management works well but, like all cities, it can be congested so we want to speed up getting in and out of the city," she said. "The road scheme is the first part of unlocking all this development land, but we also need a major scheme to help the city centre." The council has bid for government funding to realign the main route into the city centre with the Commercial Road roundabouts replaced by traffic light junctions in a bid to reduce congestion. Conservative leader, Ms Jones said the resulting development would potentially have 2,500 homes, retail and office accommodation around the former Tricorn Centre site. "What we do want is a lot of beautiful, striking tall buildings so as you come down the motorway you have - please bear with me here - an almost New York-type skyline with some really, really tall buildings." A public consultation is being carried out before the road scheme is finalised and a planning application submitted in November. Labour Portsmouth South MP Stephen Morgan welcomed the proposals but said the city was "not getting its fair share" from central government. "The Tories must now prioritise Portsmouth and give the city the investment it so desperately needs so that we can work with business to create sustainable prosperity for future generations," he said. A plan for a £500m redevelopment of Portsmouth's Northern Quarter, incorporating the Tricorn Centre site, which had been in the pipeline for more than a decade was scrapped last year.